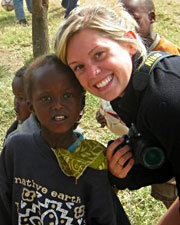 Melanie Glissman ’12 dreams of opening an orphanage someday, so she spent the summer testing that dream in Kenya. As it turns out, she has picked a good career path. An education major from Simsbury, Conn., Melanie discovered the frustrations and satisfaction of working in Africa. She and a friend, Cassidy Davidson, signed up with International Volunteer Headquarters in hopes of teaching at an orphanage. They were originally assigned to a Maasai village where most of the people had never seen a white person, let alone one with blond hair. “I made infants cry just by looking at me,” she said. More disappointing, however, was the fact that she and Cassidy weren’t needed. The village had an adequate number of teachers to the two young women were relegated to making posters for the classroom. After a week, they asked for a more rewarding post. The pair was sent to an orphanage run by the Fadhili Community and located about three hours from Nairobi where they found 32 children, ranging in age from 2 to 20, who desperately needed some positive reinforcement. Melanie and Cassidy arrived soon after the director had been fired for abusing the children. The abuse included severe beatings and withholding water. The Americans’ help was needed immediately. They rose at 5 a.m. to make breakfast for the children and then filled in as substitute teachers in a variety of classes including science, math, social studies, and English. After class they made dinner, cleaned house, and mopped floors. “It was so rewarding,” Melanie said. Children in fourth grade and up could understand English fairly well, but the younger ones didn’t so Melanie learned some Swahili. She also decided to celebrate her 20th birthday by giving gifts to the children, primarily coats, shoes, and other clothing purchased from a market two hours away. The children were exuberant and wore their coats all day, despite the summer heat. “It was the best birthday I could have asked for,” she said. Melanie will keep in touch with the group and is sponsoring one of the girls so she can go to private school. Best of all, her family decided to leave a lasting contribution to improve the children’s lives: They bought a dairy cow for the orphanage. Melanie called the summer “life changing,” but she also helped change lives. Next on her radar: a summer in Costa Rica.